Seckel pears are very small in size, averaging 2-5 centimeters in diameter and 5-8 centimeters in length, and are tear-drop shaped with a wide, round body that tapers to short neck and woody, brown-green stem. 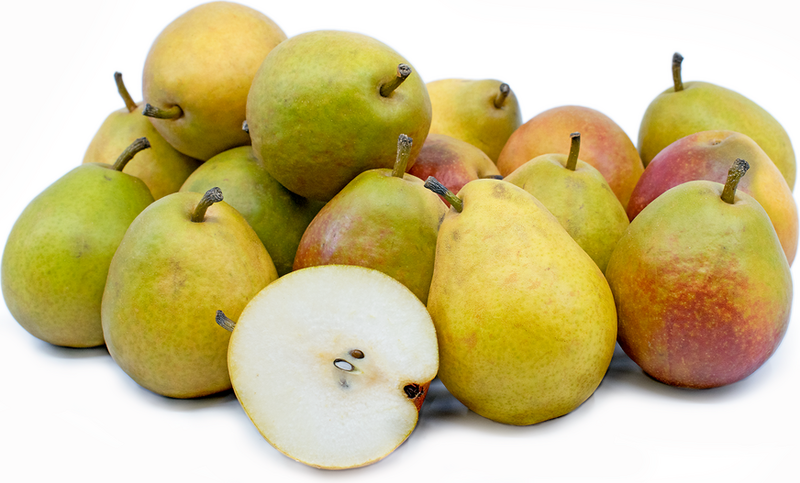 The bite-sized pears have smooth, thin, olive green skin and are covered in a glossy red blush that slightly darkens and becomes matte when ripe. The creamy, white to ivory flesh is dense, moist, and coarser than other pears and encases a central core with a few black-brown seeds. When ripe, Seckel pears are crisp, juicy, and possess the sweetest flavor profile of all the pear varieties. Seckel pears are available in the fall through winter. Seckel pears, believed to be botanically classified as a hybrid cross of an Asian pear, Pyrus pyrifolia, and a European pear, Pyrus communis, are one of the smallest varieties and are members of the Rosaceae family along with apples and apricots. 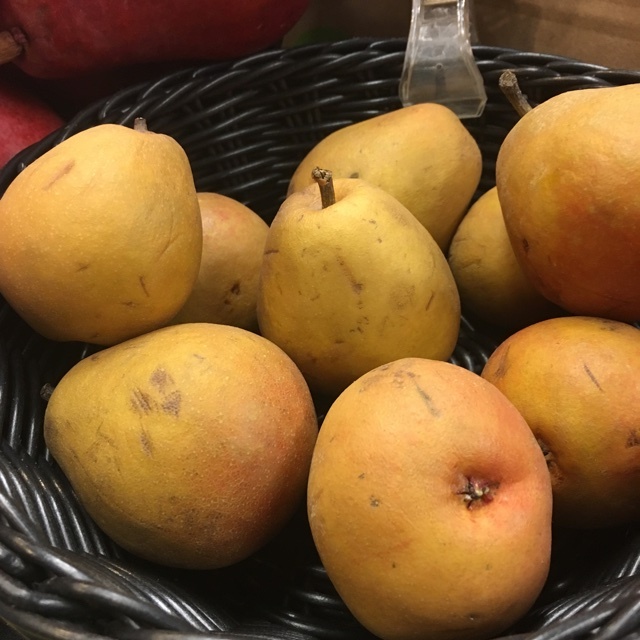 Also known as Sugar pears and Candy pears, Seckel pears are regarded as one of the only true American varieties commercially cultivated today. While their history is somewhat unknown, they were is discovered in Pennsylvania as a chance seedling and were cultivated for their compact size. Seckel pears are favored for their very sweet flavor and are versatile in the kitchen being used in fresh, cooked, and canned applications. Seckel pears provide vitamin C, dietary fiber, and some potassium and calcium. Seckel pears are best suited for both raw and cooked applications such as baking, simmering, and poaching. Known as a dessert pear, Seckel pears lend a very sweet flavor to any application and are commonly consumed fresh, out-of-hand. Seckel pears are excellent for pickling and spicing as the small pears can be canned whole or halved. They also make a great snack for children fitting nicely into lunch packs, sliced and dipped in Greek yogurt, cinnamon, and honey, served with pancakes and waffles, layered in quesadillas or sandwiches, or chopped into salsas, relishes, and chutneys. Seckel pears can be used in baked goods like pies, tartlets, and muffins, dipped in caramel and chocolate as a dessert, poached with vanilla bean and cinnamon, or juiced and sliced to serve in cocktails such as mojitos. Seckel pears compliment Dijon mustard, cucumbers, carrots, bell pepper, cherry tomatoes, pomegranate seeds, figs, orange juice and zest, parsley, endive, watercress, ginger, garlic, quinoa, pistachios, walnuts, almond butter, shrimp, meats such as prosciutto, smoked ham, chicken, and pork, goat cheese, manchego cheese, and chocolate. Seckel pears ripen from the inside-out, so the center softens first. To check for ripeness, press the fruit at the base of the stem. They will keep 2-7 days when stored in the refrigerator and only a couple days at room temperature. The exact origin of Seckel pears is somewhat disputed as one theory suggests they are from the United States, while the other theory believes that they grew from seeds left by German immigrants traveling west. Despite the opposing theories, it was recorded that Seckel pears were initially discovered as a wild seedling near Philadelphia, Pennsylvania in the early 1800s. 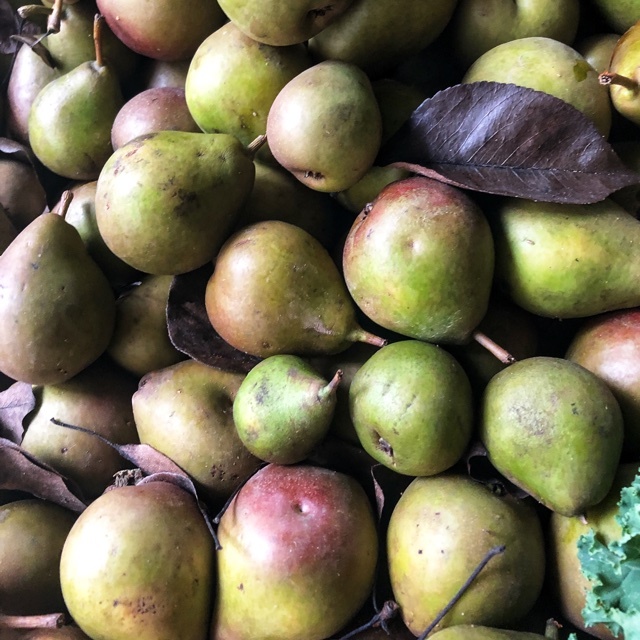 Today, Seckel pears can be found at local farmers markets and specialty grocers and growing in regions across the United States, especially in the Pacific Northwest. Recipes that include Seckel Pears. One is easiest, three is harder. 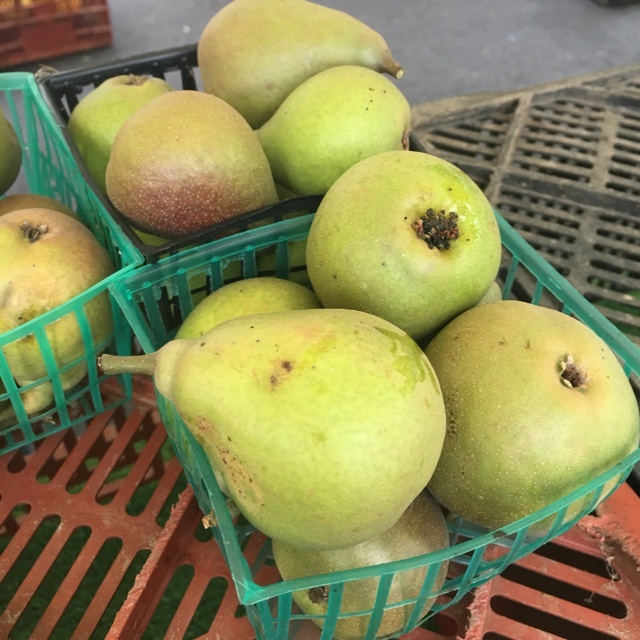 People have shared Seckel Pears using the Specialty Produce app for iPhone and Android. Sharer's comments : Seckel Pears spotted at Migliorelli Farm . Spotted at the Union Square Green Market in Union Square, NYC. Sharer's comments : Seckel Pears spotted at Whole Foods Co-op. Sharer's comments : Seckel Pears spotted at Little Italy Mercato.